Apple has released the fifth beta versions of iOS 10, macOS Sierra 10.12, watchOS 3, and tvOS 10. The latest system software beta builds are available for developers first, with the accompanying public beta version typically available soon after. Users who are actively running an existing beta version of iOS 10, macOS Sierra, watchOS, or tvOS can find the latest beta builds through the Software Update mechanism of their device or hardware. For iOS, watchOS, and tvOS that is accomplished through the accompanying Settings app, whereas macOS gets updates through the Mac App Store. 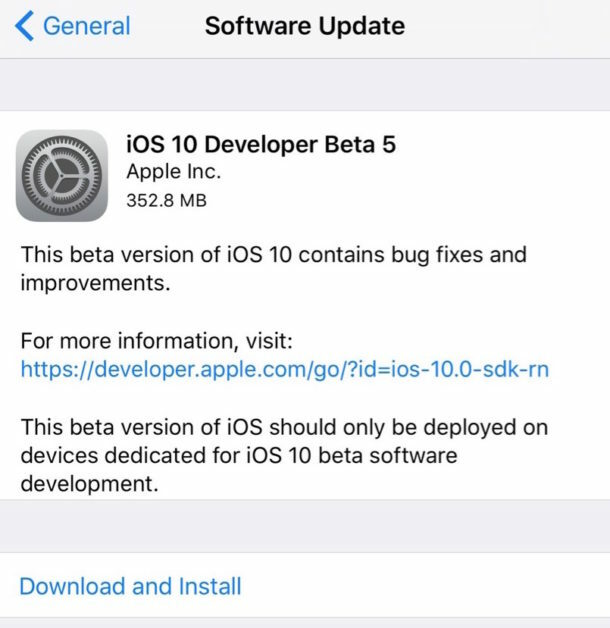 For developer betas, the release is iOS 10 beta 5 and macOS Sierra beta 5, whereas for public betas, the release is iOS 10 public beta 4 and macOS Sierra public beta 4. Despite the version differences, the builds are the same. Mac users running Safari Technology Preview will also find a new beta build of the browser available via the App Store as well. Apple typically goes through multiple beta versions before releasing a final version to the general public. It is unclear how many beta builds will be released in total, but iOS 10, macOS Sierra, watchOS 3, and tvOS 10 are set to be released to the public as final versions in the fall, likely alongside the release of new Apple hardware. Just started downloading the beta 5. Apple all of the sudden released this update. I was hearing about it may come in the mid-august. I have been installing the latest beta for almost an hour now, progress bar on Apple logo screen is about 3/4 through. It was a 200mb update for me. An hour to install 200mb? I installed the new beta iOS. It has a lot of new weird sound effects. Gratuitous, is the word you are looking for. Apple is now changing things for the sake of change. Downloading the public beta on my mac does not work. I get to the Redeem button which is filled in already. Clicking on it says it has already been redeemed. So what do I do now? Run AppStore program and click on the “purchased” tab, find “macOS Sierra Public Beta” and download again. This is not intended to be rude, but I’m going to say that if you can’t figure out how to install a beta, you should not install a beta. Installing a beta is the easiest part. Beta software is not for most. There is an entire field of software engineers and compsci grads who go into a career field called Quality Assurance and test betas professionally. Beta software is unstable and unpredictable by definition. You are going to cause yourself a giant headache if you install beta system software and you are unprepared for the consequences. Great work chander, we have a lot in common. I drank my coffee this morning and also installed the new beta iOS. Tried this for a few days now. Not too impressed as yet. Don’t like the idea of desktop and documents in iCloud, if you choose to not do this, they are removed form your desktop on screen and left with a blank screen apart from drives. Dropbox don’t work. Quite slow and computer runs hotter than normal, also uses a lot of memory when running for some reason. Cleanmymac 3 won’t delete trash. Hope these are all sorted when released.